FORT LAUDERDALE, FL--(Marketwire - January 20, 2011) - MSC Cruises makes summer vacation planning even easier with its latest "Summer Sail Abration" offer for cruises at the end of April through the beginning of September in Northern Europe. "Summer Sail Abration" rates begin at $899 per person, plus government fees and taxes (GFTs) on select 7-night fantastic fjords, route of the vikings, Baltic castles, and Russian palaces cruises. Departing from Copenhagen, Denmark and Kiel, Germany, this offer expires Feb. 28. Two of the fleet's sister ships, MSC Poesia and MSC Orchestra, feature some of the best entertainment at sea while onboard, Shanghai Chinese restaurant -- the only authentic Chinese restaurant at sea (MSC Orchestra), Kaito sushi restaurant (MSC Poesia), and the Aurea Spa for various treatments, and more. Baltic Castles and Russian Palaces, starting at $899, plus GFTs; cruise to Stockholm, Sweden; Tallin, Estonia; and St. Petersburg, Russia; Apr. 30, May 28, June 11 and 25, July 9, 10, 23 and 24, Aug. 6, 7, 20 and 21 and Sept. 3 and 4. For more information about MSC Cruises, shore excursions to these destinations, and this "Summer Sail Abration" offer, visit www.MSCCruisesUSA.com, call 877-665-4655 or contact a local travel professional. MSC Cruises is the fastest-growing cruise line in the world with a fleet of 11 ships: MSC Magnifica, MSC Splendida, MSC Fantasia, MSC Poesia, MSC Orchestra, MSC Musica, MSC Sinfonia, MSC Armonia, MSC Opera, MSC Lirica and MSC Melody. 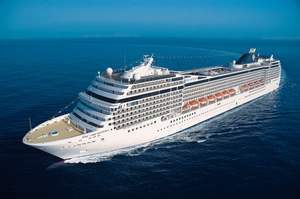 About this company MSC Cruises (USA), Inc.